These sites you don't want to miss this Passover. Our list of family-fun events from North to Negev. Tens of thousands of Israelis take vacation time during Chol HaMoed Pesach, to spend time with their children and enjoy the holiday. In honor of the Intermediate Days, Arutz Sheva has prepared a list of family-oriented events unfolding across the country, from Sunday through Wednesday. Ancient Shilo - Shilo - at the heart of Samaria, explore the ruins of the village where the Mishkan (Tabernacle) once stood - in the first capital city of Ancient Israel. Family fun for all ages. Open Sunday through Wednesday from 9:00 am - 6:00 pm. Birkat Kohanim (Priestly Blessing) - Jerusalem - Tens of thousands flood Jerusalem every year for this special blessing during Chol HaMoed Pesach and Sukkot. On Monday morning, Chief Rabbis David Lau and Yitzhak Yosef will hold a special welcoming event at the first Birkat Kohanim for Chol HaMoed at the Western Wall. Family fun event, Seven Arches Hotel, Jerusalem - On Monday, the Seven Arches Hotel on the Mount of Olives will be hosting a family fun day, including a performance from the children's band Prachei Yerushalayim (lit. 'Flowers of Jerusalem') and appearances by artists Yishai Lapidot, Idan Amedi, and Yishai Rivo. Sidewalk paintings, city of Jerusalem - 13 different sidewalk murals from artists based in Israel and abroad are being displayed across the city throughout the entire month of Nissan. 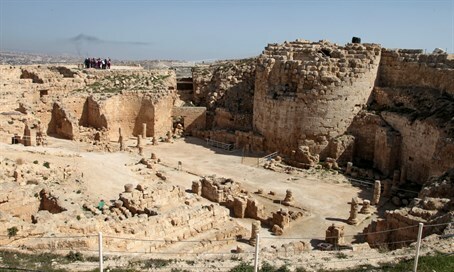 The Herodian, Gush Etzion - this incredible ancient Israelite fortress is holding family-friendly tours, workshops, and presentations throughout the holiday, including a series of survivalist workshops. Workshops and activities in Gush Etzion will be available throughout the holiday, including a special workshop for young engineers in Alon Shvut, tractor rides between Gush Etzion communities, and special cards covering all activities at Deer Lands Farm. Cave of the Patriarchs and Jewish Quarter, Hevron - the Jewish community of Hevron urges the public to visit during the holiday; Arutz Sheva will cover the main event in honor of Pesach on Monday. The event honors 50 years since the Six-Day War - and the liberation of Judea and Samaria (Shomron), the heart of Israel. Family scavenger hunt, Hevron Hills - a family scavenger hunt and tour is being hosted in the Yattir Forest on Monday and Tuesday, from 10:00am - 5:00pm. Participants will be guided from point to point with a special smartphone app. Katif Center, Nitzan - the Katif center offers families the chance to learn more about the former communities of Gudh Katif. The center will be open Monday and Tuesday, 10:00 am to 5:00 pm. Hamat Geder Nature Preserve, Yarmouk Valley (North) - Mini safaris, views to the Gilad and Golan area, and a prime spot for bird-watching, Hamat Geder invites the whole family to visit during the holiday. Yitzhak Rabin center, Tel Aviv - The Yitzhak Rabin center is hosting a special exhibit about the 1976 Entebbe operation during the holiday; free of charge. Open Sunday through Wednesday. Children's theater festival, Haifa - for the 26th year running, Haifa will be hosting a children's festival in the city, this year featuring over 200 plays and artists. Mini-plays will be running in the city streets all day long, free of charge, from Sunday through Thursday.